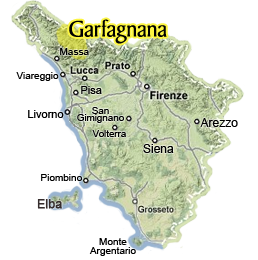 Garfgnana is a beautiful area in northwestern Tuscany, in the province of and to the north of the city of Lucca. It confines with the areas known as Lunigiana, Lucchesia and Versilia, to name just some of the better known areas. The Garfagnana is crossed in its entirety by the Serchio River, which contributes to the lush green valleys you’ll get to experience here. These set the harmonious contrast with the wild mountains that surround the area: to the east/northeast, the Apennines and to the west, the Apuan Alps. These offer visitors plenty of choices among outdoor activities: hiking, walking and mountain biking, in addition to spending time visiting the many enchanting and charming villages and other attractions found in the area. From Castelnuovo Garfagnana to Barga, from the Wind Cave (the Grotta del Vento) to the legendary Devil’s Bridge in Borgo a Mozzano to the ghost town of Vagli di Sotto, there are many places and picturesque villages waiting to to be discovered during your time in the Garfagnana valley in Tuscany. Barga is a hilltop town in the Garfagnana valley in northwestern Tuscany which offers many historical and artistic buildings to visit. Stroll along its quaint streets to discover the wonderful San Cristoforo Cathedral and the Teatro dei Differenti. Practical information on how to reach the quaint medieval town of Barga in the Garfagnana area, whether you have your own car or a rental one, or you prefer to travel by public means like bus and train. A day hike to Monte Forato, the mountain with the "hole" located in the Garfagnana area of Tuscany, on the southern edge of the Apuan Alps park.